It is maintenance time at my home QTH. Fixing storm damage, wear and tear, doing preventative maintenance and replacing broken things. I’ve had some serious help from Vern K9EME in the work. Actually too often it must be admitted I was watching as Vern K9EME took care of the work. A high energy strike nearby (I think it was when a nearby streetlight was “smoked” by lightning) had finished off an increasingly unreliable rotor, taken out the half-sloper, and I had some damage occur at the same time to the larger Log Periodic antenna, with one element suddenly impossibly drooping. Fixing the half-sloper was easy. The solder from the main wire to the connector was gone – simply burnt away, and soldering things back together and inspecting took care of that problem. Swapping out the rotor, an old Ham-IV for a new AlfaSpid RAK was a real challenge. This tower is a Tri-Ex LM354 and is a motorized crank-down with manual tip-over. The AlfaSpid RAK rotors I have all came from Alfaradio.ca in Edmonton Canada. The units are built in Poland, are a very different design than the typical small ham radio rotors, are unfortunately a bit pricey but offer great precision, high reliability, better capabilities and more precision. It was challenging work to get everything sorted and K9EME’s experience made all the difference. As there was very heavy duty eight-wire rotor cable in place, we wired the four-wire AlfaSpid with double wires on the sensor connections. Cannot tell you how useful pictures are when years later something needs fixing or replacement. Getting the Greenheron controller operating with the AlfaSpid didn’t go well, and I called Jeff at Greenheron who quickly help me figure out the protective TranZorb diodes had been fused along the way. A quick temporary fix and all was well and replacement diodes were ordered online. I have a concept for a repair that should stand up for now. More in another post. I’ll spare sharing the inspection and PM, but when you have a tower down and over it is a good time to do a full service. Spring at my home QTH brought some real weather extremes, including a few very high wind events. If I know about forecasts for mega-winds in advance I will retract my tower and point the pair of Log Periodic (LPDA) Antennas into the expected direction the wind is forecast to arrive from. But a couple times I wasn’t around or arrival of major winds wasn’t forecast, and things had to take the brunt as they are. LPDA antennas typically have two square booms spaced apart electrically, each with half of the elements on them. This is a fair bit of a wind-catcher compared to a typical beam where one round boom does duty. On my heady-duty version of the Tri-Ex LM-354 tower are a Tennadyne T-8 10-20m LPDA and a T-28 6m-1.3gHz LPDA. Book Wind Areas are 8 sqft and 3sqft, for a total if some off-center allowance is given for the chokes of approximately 12 square foot of Wind Area. The tower in standard form is rated for 26 square feet of Wind Area using the standard design and the current heavy-duty is rated for 52 sqft, so nothing about the antenna loadings themselves being pushed hard there. I’d retrofitted the T-8 with SlippNott high strength attachments back in 2013 – https://k9zw.wordpress.com/2013/06/09/installing-slippnott-upgrades-at-k9zw/ which included an added fitment at the rotor to secure the mast. The winds had slightly pushed the T-28 from its alignment with the T-8 and rotation is now indicating about 95 degrees further clockwise than actual. There is a chance something electrical is messed up, as the same high winds did pull all feed lines and rotor cable from the standoffs. Apparently the breakable restraints either died with UV, Cold and Age, or the winds were strong enough to peel the lines free. Otherwise either the rotor has broken free or something has slipped. Of course it is raining, the ground soggy, cold and the scaffold I usually use for service one the tower is down and tipped over just happens to be 130 miles (including six important water miles) away ay the Island QTH. I have a freshly rebuilt Ham-IV rotor which would be an easy swap if it is a rotor issue, or this might be the time to put in the AlfaSpid RAK Rotor I’d bought at Dayton-2014 but hadn’t yet installed. Being a bit lazy about replacing things that are working okay, I’d changed my mind and I’d intended the AlfaSpid to go to the Island QTH. So if I use it I will need to buy another. Usually every Autumn the Tower gets lowered and tipped over, and a full PM (Preventive Maintenance) completed. Because of the acquisition of the Island QTH and a heavy work load this PM got skipped in 2014 and 2015. My bad, to say the least. So now I get to pull the PM with an extra Troubleshooting Task. Want to bet I made something worse by skipping the PM? A recent visit to the eHam SDR Forum again confirms that eHam is effectively being run by trolls. The moderators are at best AWOL, and often defend the open trolling. What a failure. With a seven year effort to ask the Moderators at eHam to clean up their mess to no response, and even having these faux-moderators take me to task for complaining, it is crystal clear – eHam likes & supports Trolls. Suppose in the eHam rational anything that increases page views – aka “hits” chargeable to advertisers – is a good thing. Or perhaps the Trolls are nothing more than pseudonyms of the eHam Moderators? Nothing else seems to make sense. Regardless of the eHam rational, they are failing the amateur radio community by allowing their pet pack of Trolls to run off anyone who doesn’t agree with their non-user ultra-negative falsehoods-based Trolling. This makes the Moderators “Assistant Trolls” if not actually qualifying them as Trolls themselves, and shame on them. 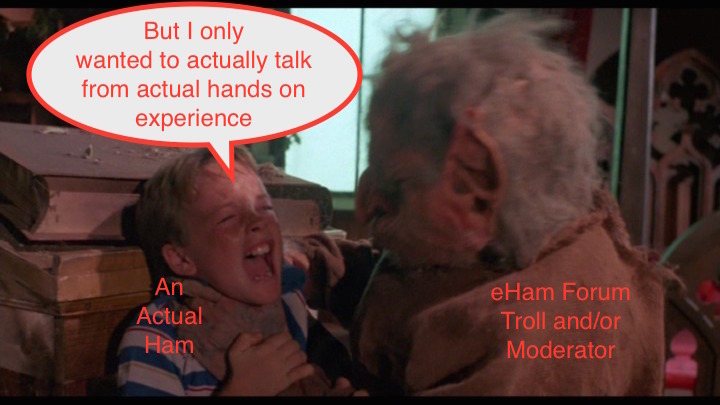 To so many of us who actually spend some coin enjoying this hobby eHam has lost relevance because of their Troll-Enablement moderation. I guess that is why I look at eHam but once in a great while, and usually leave disappointed. A word to the advertisers at eHam, while I do buy your products I will never click on a eHam ad. This is my quiet simple protest of the foulness eHam supports. No advertisers will earn my dollars through an eHam ad, ever. I’ve measured the target area and existing bench work. Howard KY6LA corresponded about the ham radio adaption of the FleXy audiophile rack system he has been using, which will be the model for my under-desk and bench-top additional shelves. In concept the station design is three radios selectable via Julius W2IHY switch gear. Radio 1 is the Flex-6700, Radio 2 the Flex-5000A and Radio 3 a TenTec Jupiter. I am ignoring the Collins S-Line station as it is pretty well self-contained and takes up too much room to co-locate with the other radios. In addition to the list room needs to be found for basic VHF/UHF operations. Still thinking about this, as I am almost never on VHF/UHF. Those who have followed my station development might recall that my operating position is one end of a small room originally intended to be our wine cellar. It isn’t time yet to move the station as two of the boys are staying with us while they attend university classes, so we still have a pretty full house and driveway. Also I think I can reasonably expect to be able to remote at least the Flex-6700 if limited to within the coverage of our router, perhaps by Dayton 2015. So at that time I may well do more operating from my correspondence desk in the library area of our house than continue to hide out in the wine cellar! Next step is to do some rough CAD sketching to fit & locate everything before I build the FleXy shelf units. Going to try for sketches by the end of the week. Well things quickly change and what started as a radio bench project and had become a slightly bigger layout redesign in September is now a full fledged project by the start of November! The size and weight of some of the storage units exceeds safe handling, so I’ve arranged for help with equipment to clear the room as much as possible. This required clearing space in our utility room for relocation which has been made ready. While I’d like to avoid custom cabinetry limitations in future flexibility and the costs, it may be the only way to go. From a practical point I can collocate an electronics workbench with my radio room and will also include spare computer project areas in the design. I also can make this a much more “social area” with room for visitors to particate in the shack. I do want to keep my NAS Raid setup which holds my music library and our data backbone hardware nearby, so some serious RF/RFI thought has to be given if the layout expands. It also makes sense to deadhead incoming cabling then do a distribution system to wire in the radio operating stations. As digging into the wine cellar walls to bury wiring is not sensible, I’ll need to plan whether cables should be routed in trays, distributed from a ceiling track, or allowed to lay on the floor. Grounding distribution will need some serious thought as well. All exciting though more involved than originally thought, expected and planned. Most likely I will cobble the present bench back together with a few changes while the designing goes along. Sketches and ideas to follow…. After a fabulous weekend out at the Chicago W9DXCC event, I’ve knuckled down to get my operating area redesigned. With new gear unopened in the box, some dating back to the Dayton Hamvention in 2012 and 2013, it is overdue. Alpha 4040 Tuner someday soon? Alpha 9500 Amp now. With Ten-Tec and Alpha/RF Concepts merged some good things are happening. Some of the Amps and Radios have really aggressive sale pricing. Example the Alpha-9500 Amp which had been raised this year to $8,750 is available for $6,995 – a combination of a $755 drop in list price and another $1,000 off in sale pricing. In my case they threw in the plug (usually another $50) and shipping was an affordable $125 for a net $7,120 vs. what would have been $8,925+ before the merger and the summer mega sale. Amp pricing is also being affected by the pricing jostling between the different manufacturers, and Alpha as a similar hot deal on their manual tune model. I’ve read where some hams are worrying that the Alpha Amps might become orphans – a valid consideration if the new merged company gave signs of anything other than success. Right now many of their products went from in-stock/overstocked to short backorder which means they don’t have to move the inventory, their sales are up, and enough of us are ordering to make forward sales positive. The best news is that the Alpha 4040 Tuner project seems to have been given new life, with announcements that the design is stable, testing (including abusive high power switching testing) has gone well, the form factor has been reduced and stabilized and the processor upgraded. No delivery date yet or confirmation of meeting the price target either, though this latest communication sure is more transparent and encouraging than the silence or limited communications during the long wait.